A range of janitorial carts suitable for a wide range of tasks. Whether it's a laundry cart, cleaning trolley or maintenance trolley you'll find a system that will suit the task at hand. Manufactured to be tough and durable, the trolley systems put all the cleaning and maintenance essentials to hand in a safe and easy to transport way. These products are highly configurable to suit whatever task they are used for. 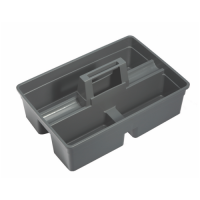 A good quality carrying tray that allows the user to take all the clea..